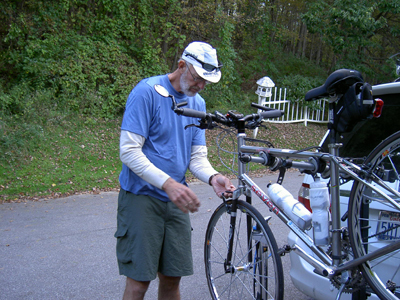 September 26: Windsor Locks to Lakeville 50.3 miles, 3400 feet climb! After a continental breakfast at the hotel, Jan and Peg decided that a goodbye latte at Starbucks was in order for Lee's departure from the group, so off down the road in the opposite direction than the plan for the day went the group -- with van, however, for one does not want to add extra miles to the odometer!!! Lattes done, goodbyes said, Lee promising to come back in a few weeks, and the group (three women plus Mark as sweeper with Nancy in van) headed out toward the west. The route first was down the main highway circling the Hartford airport so traffic was at its prime. Everyone was rushing to be somewhere! We seemed to be taking the round about way around the city of Hartford, which was fine with all of us. No need to ride on a busy street. 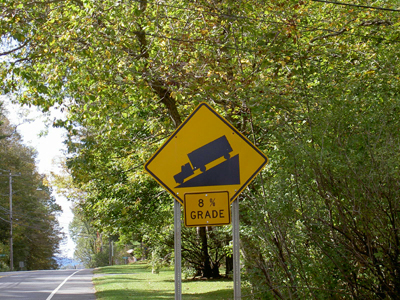 The only problem was that the road always seemed to be going up. At first we just laughed it off as the traditional morning ride -- uphill and away -- but it never seemed to end. The road was more rural now, so the traffic decreased, which in itself was a blessing, but the angle didn't. At one point each of us wasn't sure if that noise was the thunder or the beat of our hearts!! With no clouds for over a hundred miles, you guessed it! Heart beat in the mouth!!!! For every rise there should be a descent and Rainbow Reservoir was our first. The hill turned downward at about the same degree of angle as we had ascended. Result: a great coast down a highway with a wide shoulder and minimal traffic. What could be better in a biker's life? However, a little confusing -- a sign stating "No Coasting"!! How did they think we were to get to the bottom? Short lived ride!! Approaching Granby required muscle power extraordinary!! The hill/mountain went on for over two miles steadily climbing into the sky. The chance of seeing anything was short lived for the eyes were glued to the pavement about ten feet in front of the front tire and all amount of extra energy was focused on breathing! Any animal within a couple hundred yards of the roadway was well alerted to approaching humans -- the panting of three bikers trying desperately to make it to the top without stopping is loud, steady and scary!!! Gransby is a cute little New England town, but also on the downhill side, so stopping was not an option. Just coast on through and hope by the time one reaches the city limits on the other side the heart had resumed normal functioning! Next town Pleasant Valley -- yes, that is right VALLEY! Have to go down to get to one of those!! We are now very close to the Massachusetts/Connecticut/New York border, which positions us in the Berkshires. Beautiful with rivers and lakes appearing on either side as we pedal by. No, pedal up. For every valley there is a corresponding hill/mountain and we are finding them all. One more time up we go pass old farm houses and farmer's markets full of pumpkins for sale. Winsted is at the bottom of another long coast, so a perfect place to stop for lunch. 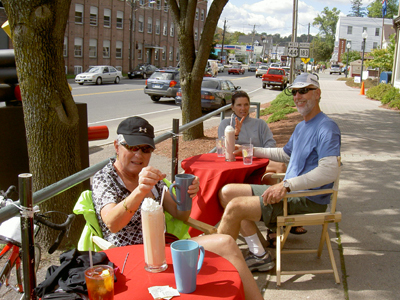 A cute cafe just happens to appear on the village green and they have creamsickle smoothies! A must!! The place is called Cafe 64 (www.cafeat64main.com) which is housed in an old 18 century building. The chill from the morning was gone, so sitting outside in the sun was the perfect way to go. Norfolk was the next town on the route. 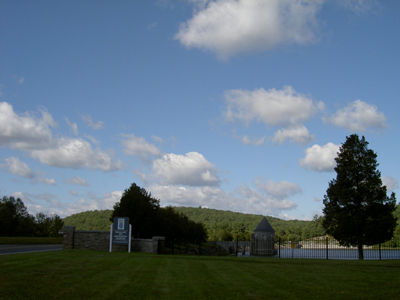 It is a beautiful New England town full of the colonial style homes and the stone walls separating the properties. The village green stands prominent with the expected statue commemorating one of their heroes. It is also the highest point in the area. 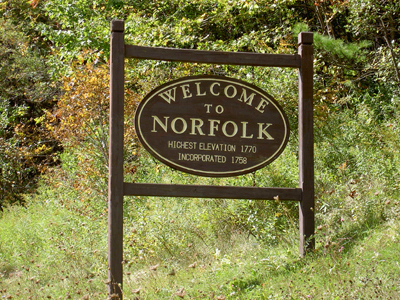 According to the welcome sign Norfolk is 1770 feet above sea level and was incorporated at about the same date!! Wonder if there was a plan here? 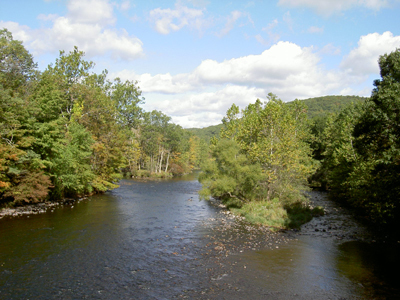 East Canaan, Canaan, Salisbury -- all charming New England villages nestled in the Berkshires. Unfortunately for us, they are all at the top of huge hills. By the time one finishes pedaling up the incline, there is no energy to enjoy the quaintness of these communities. However, a quick look and a run of the imagination and even with the heart beating at 300 beats per second, the visualization of what life was like 200 years ago is possible. For one, they didn't have cars and trucks -- they had to either walk or ride a horse up that road, so they knew what real life was like!! Lakeville is also up a hill. Our home tonight is not quite at the top, which means tomorrow we must continue the climb, but we will be with fresh legs!!! Jan's kids went here to boarding school, so she is familiar with the area. Dinner at the Boat House and then retire to the room and bed. Tomorrow promises more leg exercise!! Notice the Angle of the Road! 8% Still to Come! Norfolk = Highest Elevation = 1770'! Jan: "Okay, Nancy How Does This Pump Work?" Mark: "Oh Jan, This Doesn't Look Good!" Nancy & Mark: "See Jan, Just Push Here and Pull There -- It All Works Out!"